I was actually semi-surprised by The Call, I was honestly expecting to completely hate it and want to smash my TV after I watched it. But I didn’t hate it and definitely didn’t smash my TV, despite this being a “WWE Studios” film, which are notoriously horrible. Unlike most WWE Studios films, this one had some actual star power in Halle Berry and Abigail Breslin — that didn’t stop them from adding in wrestler-turned-quasi-actor David Otunga, and round out the cast with a bunch of relative unknowns. The premise of the movie sounded enticing, which is why I decided to give it a viewing last night. A 911 operator takes a call from a girl that’s been kidnapped and is in the trunk of a car. 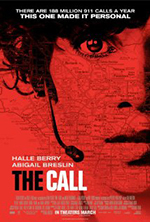 After a bad experience with a similar situation months earlier, Halle Berry‘s character Jordan takes the reigns on the phone and tries to help Abigail Breslin‘s Casey escape. A solid concept for the story, and one that I enjoyed. Abigail Breslin gives a riveting performance as the girl who thinks she’s about to die. At some times I almost believed she was really in danger. Her screams were deafening at times, but I enjoyed it. Halle Berry is equally as great as she always is. She conveys a pain from her character that you’d expect, given the situation she’s placed in. My favorite part was towards the end. Without giving anything away (though you can probably guess what happens), I enjoyed the last few minutes quite a bit. It was a nice change to see it end the way that it did. I also quite enjoyed the way it was filmed. It’s hard to explain but during key points in action shots, the video freeze frames for a second right before something’s about to happen, almost like a teaser of “this guy’s going to do something right now!” I quite liked that. It wasn’t something I’ve often seen in other movies. Would I recommend The Call? Sure. If you’re at home on a weekend and want to grab something mindless but fun from Redbox or Netflix, have at it. It’s a great hour and a half.